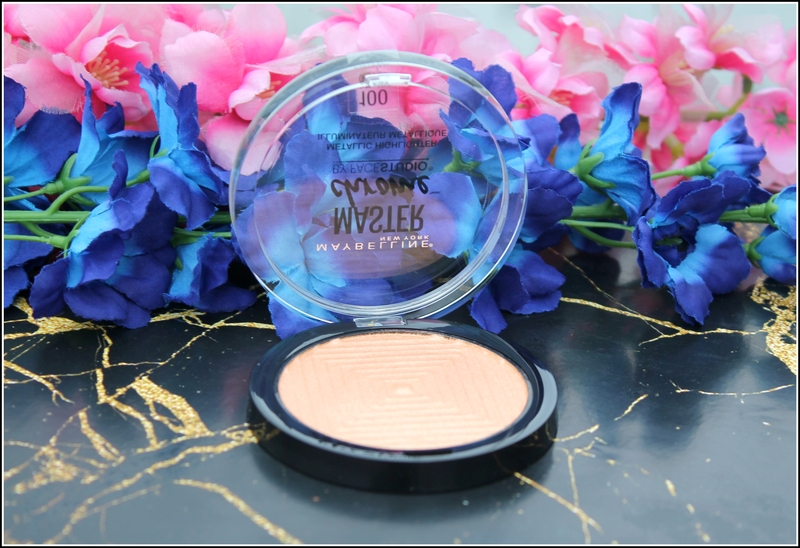 I know I am a bit late in reviewing the Maybelline Face Studio Master Chrome Metallic Highlighter in Molten Gold but I still wanted to review this gorgeous gorgeous highlighter on my blog. I picked up this beauty last month from Nykaa during the holi sale and I have not kept it down ever since I got hold of this. 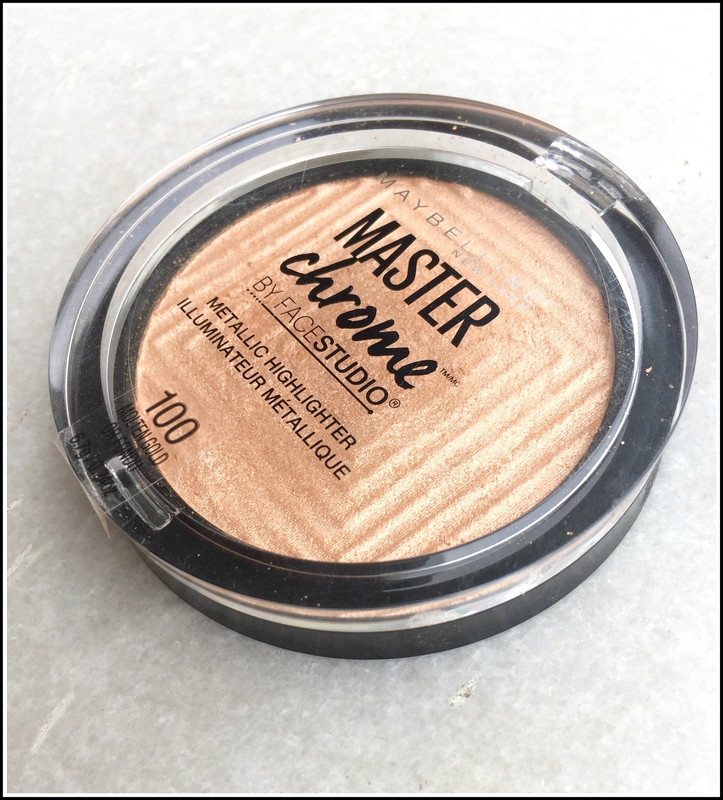 I have too many highlighters but I could not resist buying this one and I am so glad I got this one because it is seriously one of the best highlighters available in the Indian market right now. 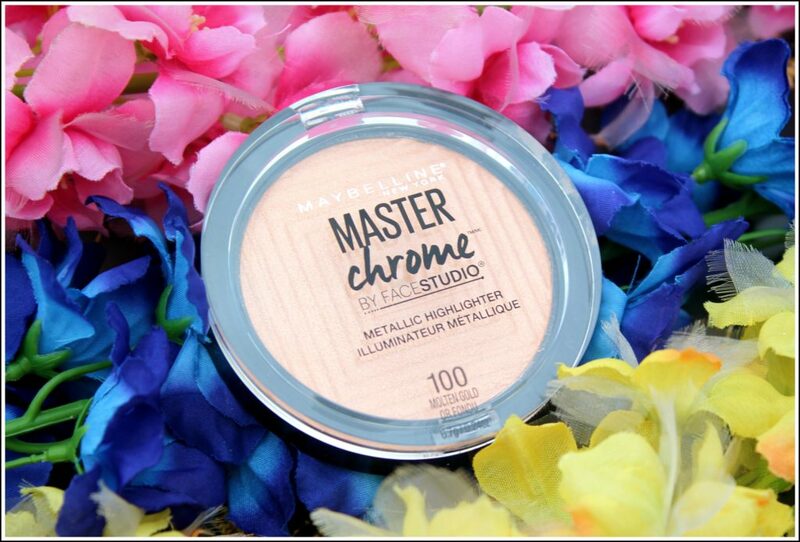 Maybelline Face Studio Master Chrome Metallic Highlighter Makeup effortlessly envelopes the skin in a molten metal sheen. Meet the secret to brilliant and luminous skin. This highlighter powder drenches skin in a melted metallic finish. Maybelline’s pearl pigments leave a reflective finish for a brilliant glowing skin. Step 3: Blend for a seamless metallic glow. I got it for Rs.380. 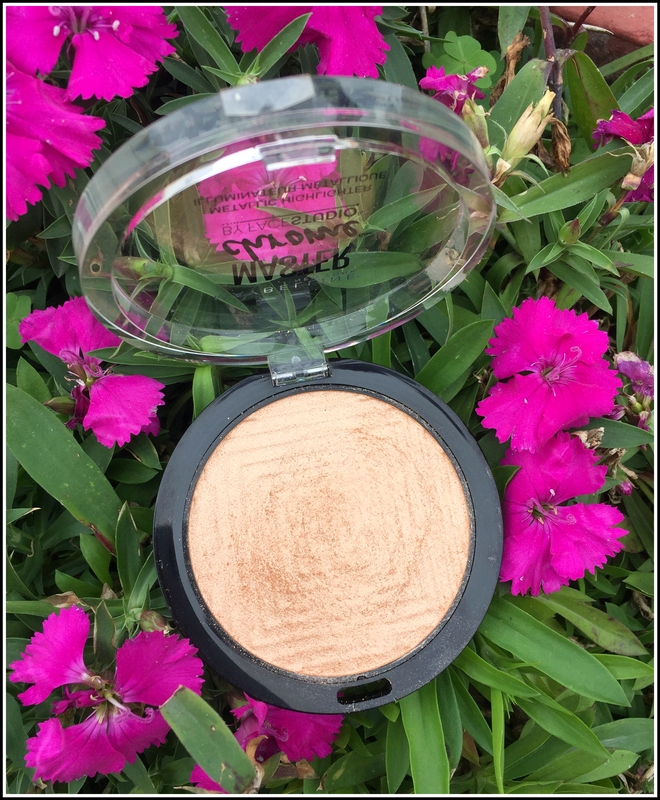 Maybelline Face Studio Master Chrome Metallic Highlighter in Molten Gold comes in a round pan with a clear lid. The product name and the shade name is mentioned on the transparent lid. The ingredients and all the other details are mentioned on the bottom of the pan. The pan is quite lightweight and travel friendly, you can easily slip it in your handbag for touch-ups. The highlighter does not come with a mirror; otherwise the packaging is quite good. The pan closes quite tightly with a click sound so there are no chances of the pan opening up during travel. Once you open the pan there is a geometric design imprinted on the highlighter. 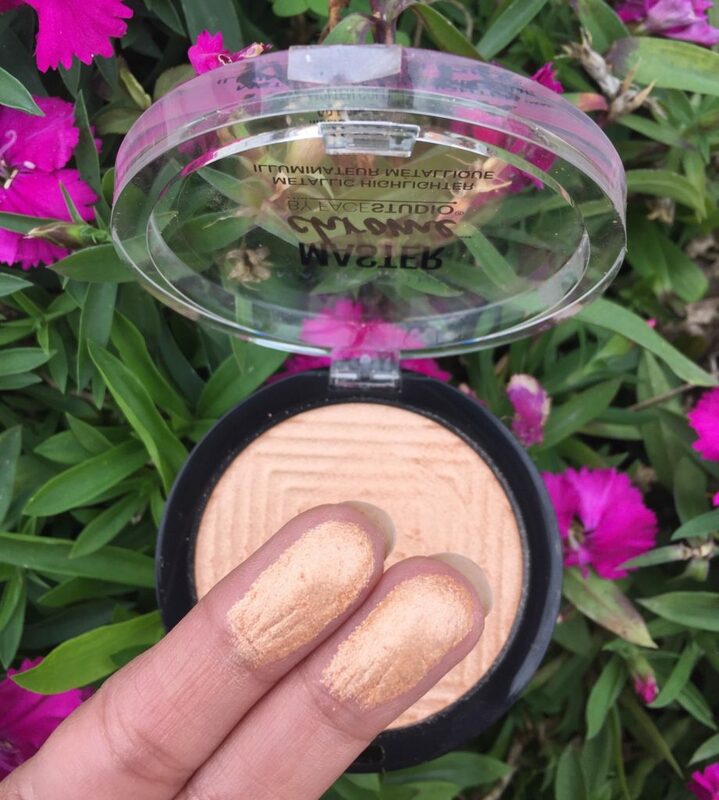 The Maybelline Face Studio Master Chrome Metallic Highlighter is available in a single shade named 100 Molten Gold. It is a gorgeous beautiful warm golden shade with very finely milled shimmer particles. This is a deeper shade of gold with a hint of copper to it. The highlighter is a perfect shade for deeper skin tones. The highlighter has a very fine texture, it is so finely milled that you won’t find any chunky shimmer particles in the highlighter. The particles are very minute and they give a very beautiful sheen to the skin. The shimmer particles won’t accentuate any texture on the skin, it does not cling on to dry patches, it applies on the skin beautifully and gives a very healthy glow to the skin. This is one of the most beautiful and the most unique shade of highlighter that I have in my stash. It is perfect for all Indian skin tones. It suits my fair skin tone so well and I feel because of the golden shade it will look amazing on someone within a deeper skin tone also. 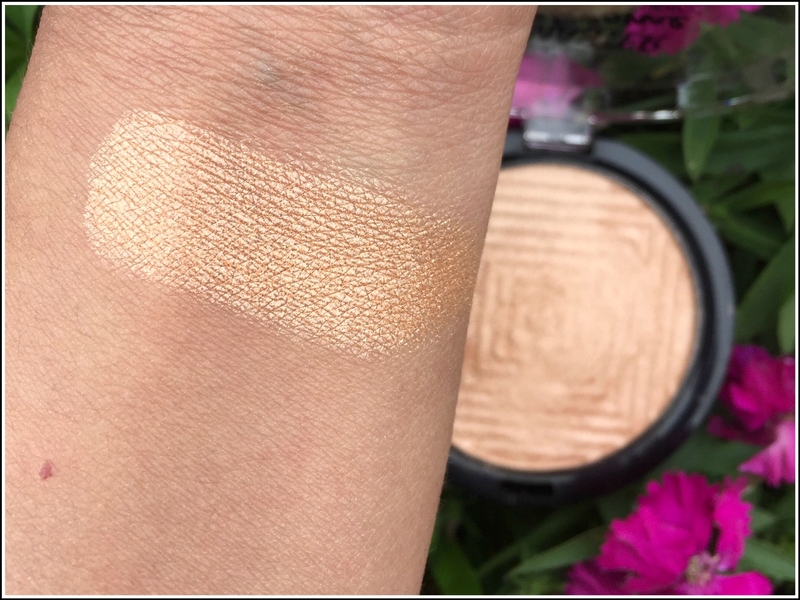 I just love how beautifully the golden shade has been balanced in this highlighter. It is looks so natural under sunlight, it gives a glow from within sort of illusion to the skin. It looks extremely beautiful under artificial light and at night time also. So you can wear this beauty during the day as well as at night. The highlighter is super pigmented, super soft, super buttery and blends into the skin like a dream. It feels very light weight on the skin. 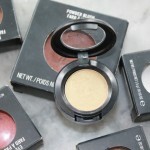 It blends effortlessly and does not feel powdery or patchy at all. You just need to swipe your brush once in the pan, hit it on the high points of your face, blend it nicely and you are done. It takes just a few seconds to blend into the skin and gives a beaming glow to the skin. The highlighter stays on the face for a good 5-6 hours and does not budge or move during the day. I sometimes scrape off some powder from the pan, mix it with my moisturizer and apply it on the high points of my face before I go in with my base makeup products. This step gives a very illuminating glow and healthy natural glow to the skin. I sometimes apply this highlighter as a eye shadow all over my lid and it looks equally good. 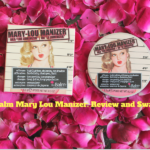 Even if you are not a highlighter lover, this highlighter will convert you into one. I just love this beauty and this is so affordable, so you need not spend your money on a dozen expensive highlighters, just grab this and you are sorted. I am extremely happy with this highlighter. 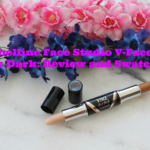 It has an amazing formula and I am seriously obsessed with the shade and the finish. 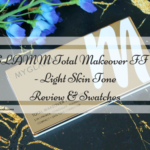 This is a perfect highlighter for all Indian skin tones and at such affordable price you cannot find a better option. High end low end this is one of the best highlighters that I have ever owned. Will suit almost all Indian skin tones. It has a very smooth buttery texture. Blends in like a dream. Gives a glow from within kind of glow. Does not have chunky glitter particles. Does not have a mirror. 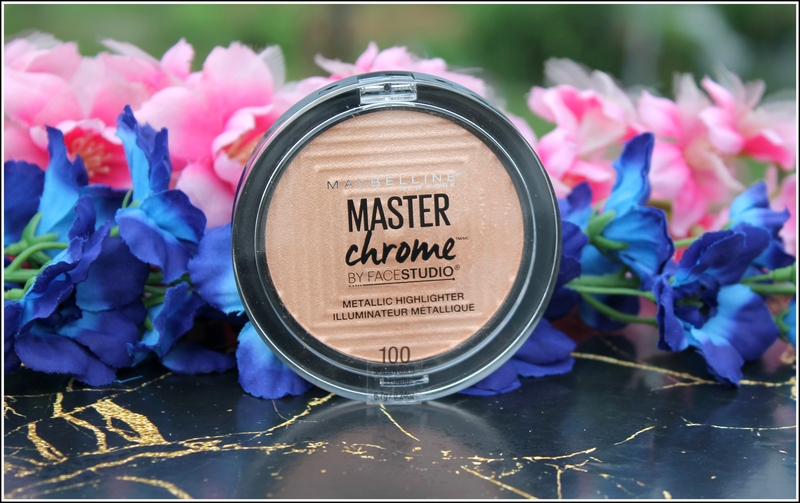 Will I repurchase the the Maybelline New Face Studio Master Chrome Metallic Highlighter in Molten Gold? 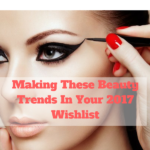 Definitely, I will keep on repurchasing it as long as I put makeup on my face. 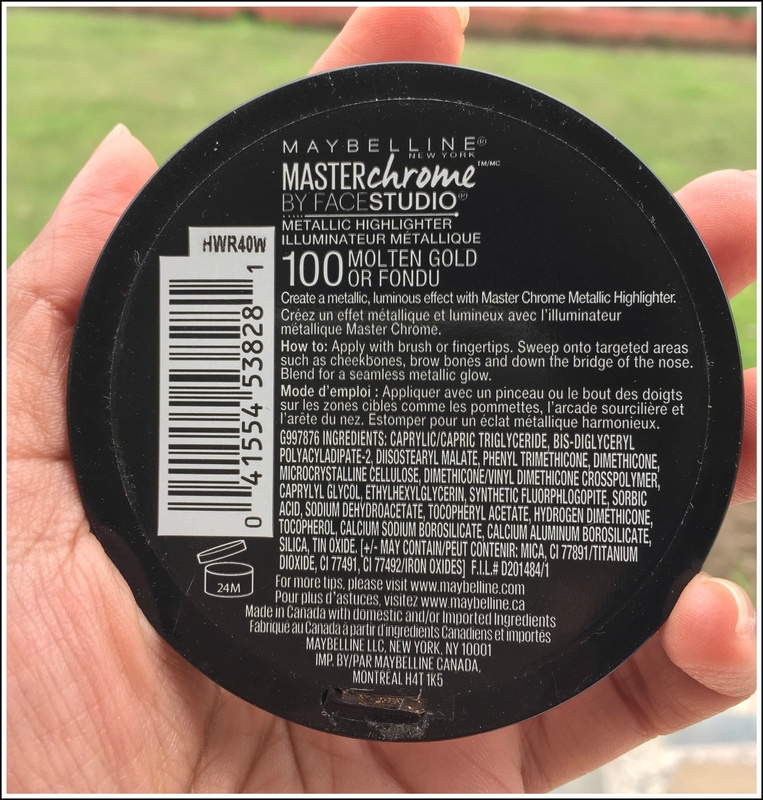 Will I recommend the the Maybelline New Face Studio Master Chrome Metallic Highlighter in Molten Gold? I would recommend this highlighter to each and every girl out there. 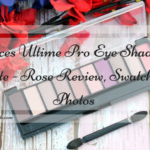 This is a must have for all makeup junkies.